•Cut out all frills, thrills and decorative elements. The masculine almirah is crafted from straight lines. • Use thick sections and structures. This will increase cost but exude a sense of proportion and strength. • Contrast your finishes subtly: a dark matt veneer, a smoked glass mirror and warm tan leather. • The almirah must be sectioned into clear independent areas. 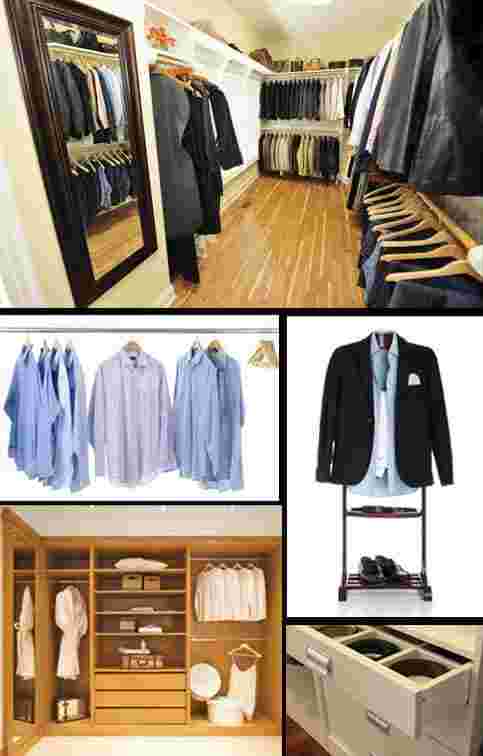 Hangers for pants, shirts and coats, slim shelves for stacked shirts. • Use interior lighting. Choose compact flourescent lamps for coolness. • Finish everything off with a small refrigerator to house your personal mini bar. • Break structural monotony with positive and negative elements: some closed sections, some open ones. • Accessories must have their own space: tie drawers, watch and jewellery drawers, belt hooks, pull-out shoe racks and pneumatic pull-down hanging racks.